The Club's aim is to enjoy singing in a friendly and supportive environment. Memory Lane Singing Club is a registered charity. 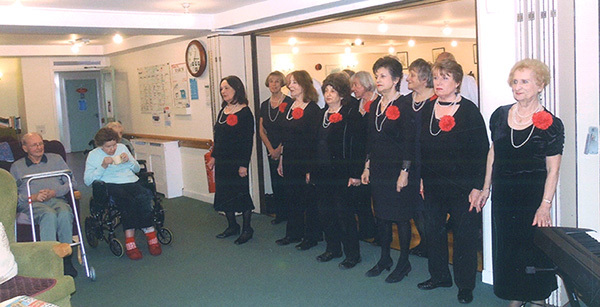 The Club entertains in the community, especially at residential homes, day care centres and charity events. There is no obligation to perform but the Club encourages and nurtures group singing. Everybody can sing – so come along to your local singing club and we'll prove it. No auditions and no need to read music. You are invited to a free taster session before joining. You will meet the members and you can participate in the singing session. Singing is ideal for those looking to develop new skills and make new friends. To teach singing skills in a professional, friendly and supportive environment. To entertain in the community, especially the isolated elderly, sick and disabled. To welcome many new members our singing group. Guys and Dolls, Luck be a Lady, Somewhere, Tonight, Close to You, Night and Day, Take Good Care of my Baby, Cheek to Cheek, Bring me Sunshine. in 1993 and was the Musical Director until she retired in 2008 to pursue new challenges.